You can add extra pages of content to your Ning Network using the Pages feature. Your new pages can contain any content you’d like,Â such asÂ widgets, photosÂ or hyperlinks.Â Make themÂ visible to anyone, members only or Administrators.Â Pages can even be expanded to take up the whole page by simplyÂ unchecking a box to remove the sidebar. You can alsoÂ decide whether or not members may comment on your pages. ImSaturn shows off its impressive 2009 Lineup in an elegant way using a page. 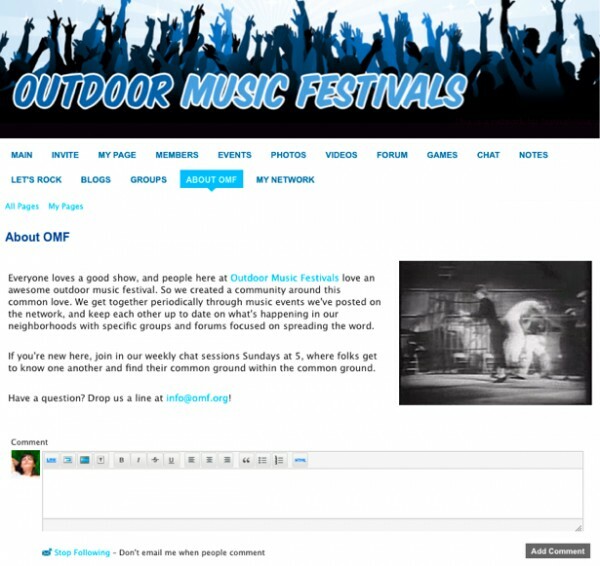 Outdoor Music Festivals shows off a page with a comment box and no sidebar present. You can view all of your created Pages on your networkÂ by clicking on the page tab from your navigation bar and then clicking on the “All Pages” link located on the page. If you don’t have tabs for your pages, you can view all of your Pages by typing in the direct URL: http://yournetworkname.ning.com/page/page/list. Pages differ from the Notes feature in that pages create more search engine friendly URLs and don’t automatically display on the main page of your network, whereas notes do. Learn more about the Notes feature here. Check out the related articles for more information on how to use the Pages feature.